A series of floods hit Queensland, Australia, beginning in November 2010. The floods forced the evacuation of thousands of people from towns and cities. At least 90 towns and over 200,000 people were affected. Damage initially was estimated at around A$1 billion before it was raised to $2.38 billion. The estimated reduction in Australia's GDP is about A$30 billion. As at March 2012, there were 33 deaths attributed to the 2010–11 Queensland floods with a further three people still missing. A$2.38 ($2,389,225,876) billion; 200,000 people were affected. Three-quarters of the council areas within the state of Queensland were declared disaster zones. Communities along the Fitzroy and Burnett Rivers were particularly hard hit, while the Condamine, Ballone and Mary Rivers recorded substantial flooding. An unexpected flash flood caused by a thunderstorm raced through Toowoomba's central business district. Rainfall from the same storm devastated communities in the Lockyer Valley. A few days later thousands of houses in Ipswich and Brisbane were inundated as the Brisbane River rose and Wivenhoe Dam used a considerable proportion of its flood mitigation capacity. Volunteers were quick to offer assistance, and sympathy was expressed from afar. A large mobilisation of the Australian Defence Force was activated and a relief fund created. The head of the recovery taskforce was Major General Michael Slater. The Queensland Reconstruction Authority (CEO was Graeme Newton) was formed to coordinate the rebuilding program beyond the initial task force, and a Commission of Inquiry was established to investigate all matters related to the floods. The state's coal industry was particularly hard hit. The Queensland floods were followed by the 2011 Victorian floods which saw more than fifty communities in western and central Victoria also grapple with significant flooding. Brisbane experienced major flooding in 1893 and 1974 as the Brisbane River broke its bank and inundated low-lying areas. Towns including St George and Theodore had dealt with major flooding earlier in 1996. The floods were a result of heavy rainfall caused by Tropical Cyclone Tasha that combined with a trough during the peak of a La Niña Modoki event. The 2010 La Niña Modoki weather pattern, which brings wetter conditions to eastern Australia, was the strongest since 1973. This La Niña event caused a prolonged event of heavy rainfall over Queensland river catchments. Record or near to record sea surface temperatures were recorded off the Queensland coast in late 2010. December 2010 was Queensland's wettest on record, with record-high rainfall totals set in 107 locations for the month. The state's average rainfall level of 209.45 millimetres (8.25 in) exceeded the previous record of 200.1 millimetres (7.88 in) set in 1975. 2010 was also recorded as the state's wettest spring since 1900 and the Australian continent's third-wettest year. Climate scientist Kevin Trenberth thought climate change was a contributing factor in the unusually high precipitation rates. He attributed a half-degree Celsius rise in ocean temperatures around Australia to global warming which produces extra water vapour and intensifies the monsoon. Other scientists say that it is too early to draw such a conclusion. Assertions were also made by Professor Hubert Chanson, an expert in dam and reservoir engineering with extensive firsthand knowledge of the Wivenhoe system, that mismanagement of the Wivenhoe Dam might be a contributor to the some flooding in the lower Brisbane valley. While an expert engineer, Michael O'Brien—a senior manager of an ASX-listed resources company and an outside consultant evaluating cause—agrees that "massive releases of water from Wivenhoe Dam on Tuesday, January 11, did indeed produce most of the flooding in the Brisbane River the following afternoon, with a peak in the early hours of Thursday morning, January 13. The dam's releases into the Brisbane River also caused the Bremer River, which winds through the city of Ipswich, and the Lockyer Creek to back up and cause much of the flooding outside Brisbane." This was corroborated by a panel of engineers hired by Insurance Council of Australia. O'Brien also found that the Wivenhoe Dam and Somerset Dam did not hold the maximum capacity they were capable of holding during the crisis period, which would have significantly alleviated flooding. Only one source, Neal Ashkanasy, who specialises in social and organisational psychology (and 35 years ago was involved in the design of Wivenhoe Dam), found fault with these results and instead finds that the dam was operated correctly throughout the time of the storm and the flood that followed, saying the "dam was run with outstanding precision." Isolated flooding started across parts of the state in early December. On 23 December a monsoonal trough crossed the coast from the Coral Sea, bringing torrential rain that fell in a broad swath from the Gulf of Carpentaria to the Gold Coast. The widest range of intense rainfall occurred on 27 December with very high daily totals recorded on 25 December near where Cyclone Tasha crossed the coast. By 30 December vast areas of Southern and Central Queensland were affected by the flood. The conditions led to a large influx of snakes in the Rockhampton area, as well as some crocodiles. NASA image showing swollen rivers and cloud cover. Flooding was widespread across Queensland and New South Wales from the end of December 2010 to January 2011 with several separate rain events causing rivers to rise over a lengthy period. Many places, including Condamine and Chinchilla were inundated by flood waters on multiple occasions. About 300 roads were closed, including nine major highways. During the flooding it was reported that more than three-quarters of Queensland was affected by flooding. The flooding initially forced the evacuation of 1,000 people from Theodore and other towns, described as unprecedented by the acting chief officer of the Emergency Management Queensland. The military transported residents by helicopter to an evacuation centre at Moura. The total evacuation of a Queensland town was a first for the state. Major flooding at Theodore persisted for more than two weeks. Emerald was cut off by road on 29 December as the Nogoa River rose. By the next day, the river surpassed the 2008 flood peak level of 15.36 metres (50.4 ft). At the peak of the flooding, 80% of the town was flooded, the worst the town ever experienced. Twelve hundred Emerald residents registered as evacuees. Rockhampton had nearly a week to prepare for an expected flood peak from the Fitzroy River, which courses through the centre of the city. The airport was closed on 1 January. A metal flood barrier was erected around the terminal to prevent flood-borne debris from causing damage to the structure. An evacuation centre was set up at the Central Queensland University. The Bruce Highway leading south out of Rockhampton was closed to traffic. The river peaked at 9.2 metres (30 ft), just short of the predicted 9.4-metre (31 ft) maximum. The Port of Gladstone reduced its export capacity because the coal stockpiles at the port were saturated and further coal deliveries could not be made by rail. The Goonyella railway line which serves a number of coal mines in the Bowen Basin was closed for one week and shipments of grain were also delayed. The central Burnett towns of Gayndah and Mundubbera saw major flooding on 28–29 December. The Burnett River peaked at 18.25 metres (59.9 ft) at Mundubbera—the highest river height since 1942—inundating more than 20 houses. Downstream at Gayndah, the river peaked at 16.1 metres (53 ft) with floodwaters reaching two houses. Both towns were isolated for several days and there was major disruption to the potable water supply and local agricultural production. Bundaberg experienced severe flooding, the worst in 40 years, after the Burnett River flooded the city, although the Paradise Dam reservoir contributed to some flood mitigation. This resulted in the evacuation of 300 homes. The Bundaberg Port, a major sugar exporting facility, was closed late in December 2010 as flooding deposited silt in the port, forcing its closure. The port re-opened in early March 2011 after successful dredging operations allowed ships to berth. Chinchilla and Jericho were also inundated. At least 40 residents were evacuated from Chinchilla. Flooding in Dalby was the worst since 1981. The town's water purification system was flooded, resulting in water restrictions that hampered clean-up efforts. 112,500 litres (24,700 imp gal; 29,700 US gal) of water were transported to the town of 14,000 residents. Warwick was isolated when all roads into the town were cut off. The Condamine River reached 14.25 metres (46.8 ft) on 30 December, its highest level ever recorded. Condamine was mandatorily evacuated on 30 December. A second rain event on 9–10 January saw floodwaters again threaten Chinchilla and Condamine with Chinchilla residents again asked to evacuate. The Macintyre River, which forms part of the border between the Australian states of New South Wales and Queensland, began to threaten the town of Goondiwindi on 13 January. While the town is protected by an 11-metre (36 ft) levee, the local hospital and aged care home were evacuated as a precaution and an evacuation centre was established. Heavy rain in the Mary River catchment on 8–9 January 2011 led to flooding at Maryborough and Gympie. The Mary River at Maryborough was expected to initially peak at 8.5 metres (28 ft) at midday 9 January with some houses and businesses inundated by flood waters. Long and Mackenzie Streets in suburban Toowoomba flooded. 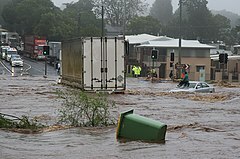 The city of Toowoomba, in the Darling Downs, was hit by flash flooding after more than 160 millimetres (6.3 in) of rain fell in 36 hours to 10 January 2011; this event caused four deaths in a matter of hours. Cars were washed away (see video). Toowoomba sits on the watershed of the Great Dividing Range, some 700 metres (2,300 ft) above sea level. A three-week period where it had rained on all but three days had left the soil around Toowoomba super saturated and when a line of storms hit the city on 10 January, the resulting torrential rain rapidly ran off down gullies and streets. The central business district of the city sits in a small valley where two small water courses—East Creek and West Creek—meet to form Gowrie Creek. Unable to cope with the volume of water heading toward them, the creeks burst their banks, pushing a devastating wall of water through the city centre. This water then headed west—not towards the Lockyer Valley which was also experiencing extreme rainfall that fell on eastern facing slopes. The surge associated with rainfall which fell on the eastern side of the range passed through the Lockyer Valley town of Withcott, where the force of the water pushed cars into shops and forced the evacuation of hundreds of people. The scene was described by an onlooker as "like Cyclone Tracy has gone through it ... If you dropped an atom bomb on it, you couldn't tell the difference." Nearby Helidon had several homes and farms flooded but did not break the main creek bank and enter the town. It was cut off from all sides by destroyed roads. Grantham was also devastated by the surge of water. Houses were left crumpled by what Premier of Queensland Anna Bligh described as an "inland tsunami". According to local media, the flood waters had reached a height of 7 or 8 metres (23 or 26 ft) by the time it struck Grantham. The peak discharge rate around Withcott and Grantham where Lockyer Creek is joined by Gatton Creek, was estimated to be 3,500 m³ second. At least 100 people were evacuated to the Helidon Community Hall. Nine people were confirmed dead, and many more feared dead among 66 reported missing. The body of one victim washed away at Grantham was recovered 80 kilometres (50 mi) downstream and Queensland Police Commissioner Bob Atkinson warned that some bodies may never be found. Nearby Gatton saw voluntary evacuations as the Lockyer Creek rose to a record height of 18.92 metres (62.1 ft), exceeding the previous record set in the 1893 Queensland floods. Three people from Grantham listed as missing were officially declared dead by the Coroner on 5 June 2012. Wheel of Brisbane during the floods. This detailed astronaut photograph illustrates flooding in suburbs of the Brisbane metropolitan region. Flooding began to affect low-lying areas of Brisbane on the morning of 11 January 2011. By around 2:30 p.m. AEST, the Brisbane River broke its banks leading to evacuations in the Brisbane CBD and the suburbs of Fortitude Valley and West End. An evacuation centre was established for flood-affected residents at the RNA Showgrounds in Bowen Hills. Residents of 2,100 Brisbane streets were advised to evacuate prior to the arrival of floods, which struck the city on 12 January. Lord Mayor Campbell Newman stated than an estimated 20,000 homes would be affected when the river peaked on 14 January. He subsequently advised that the Brisbane River transport infrastructure had been "substantially destroyed". The Brisbane River peaked on 13 January at a lower level than predicted, but still 20,000 houses in Brisbane were inundated. Some of the Brisbane suburbs worst affected by the floods were St Lucia, West End, Rocklea and Graceville. The floods damaged some of Brisbane's icons. The Brisbane Riverwalk, a floating walkway over the Brisbane River linking the inner city neighbourhoods of Fortitude Valley and New Farm, broke up, with a section forming a 300-metre (980 ft) "floating missile" that threatened the Sir Leo Hielscher Bridges. The largest part of the floating boardwalk was safely guided under the bridge by a tugboat and past other infrastructure before being safely secured. Brisbane's major Rugby league and Soccer (Association Football) venue, Suncorp Stadium, filled with water up to 2 metres (6.6 ft) deep, reaching the third or fourth row of seats. With the flood peaking at 4.46 metres (14.6 ft) in Brisbane City, the flood level was about the tenth-highest in the city's history, several metres below the 1890 flood and the two major floods in 1893. Some unique field measurements about the peak of the floods showed very substantial sediment fluxes in the Brisbane River flood plains consistent with the murky appearance of floodwaters. The field deployment showed also some unusual features of flood flow in an urban environment linked with some local topographic effects. Parts of the western suburbs of Brisbane were cut off for three days. Resident of suburbs including Bellbowrie, Karana Downs, Moggill and Pullenvale were running low on food and other items when Moggill Road was cut, until the Australian Army was able to reach the area on 15 January with supplies. The Bremer River at Ipswich, 30 kilometres (19 mi) west of Brisbane, reached a height of 19.4 metres (64 ft) on 12 January, inundating the central business district and at least 3,000 houses. One third of the city was reported to be underwater and over 1,100 people took shelter at evacuation centres. At Minden, on the border of Ipswich City, a four-year-old boy was swept away by floodwaters when he fell from a rescue boat. A man in his fifties died when he accidentally drove into floodwaters in the Ipswich suburb of Wulkuraka. The worst affected areas of Ipswich were the suburbs of Goodna and Gailes. The flooding allowed bull sharks to reach the center of Goodna; one was spotted swimming in Williams Street, and a second in Queen Street. Further upstream, Hubners Bridge and Richards Bridge near Kilcoy were washed away. Both bridges have been rebuilt and reopened in 2012. In South East Queensland, the Wivenhoe Dam filled to a level equivalent to 191% of its supply capacity on 11 January 2011. Although the dam can hold the equivalent of 225% of its supply capacity, storage exceeding 100% is required to be progressively released through the floodgates to restore capacity to mitigate future flood events. Brisbane experienced its wettest December since 1859. Wyaralong Dam, near Beaudesert, had recently been completed and was praised for mitigating flooding in downstream Logan, having exceeded 80% of its capacity. In North Queensland, the town of Ingham became isolated as the Herbert River peaked. Homes at Babinda and Gordonvale were flooded. Flooding of a caravan park and motorway at Ipswich suburb of Gailes. As of March 2012, 33 deaths have been attributed to the floods with a further 3 people still missing. The first death occurred on 30 November 2010, when a woman drowned in her vehicle near Dysart. In the following weeks, five others died from similar circumstances. Nine people drowned after being caught directly by the flowing waters. and thirteen people died in other circumstances. Thirteen-year-old Jordan Lucas Rice died 10 January 2011 after insisting that his 10-year-old brother Blake be saved from the flood waters before him. He drowned along with his mother, 43-year-old Donna Maree Rice, both being residents of Toowoomba. He has been called an Australian hero by the media and in 2015 was post-humously awarded the Australian Bravery Medal for his sacrifice. More than 55,000 volunteers registered to help clean up the streets of Brisbane, with thousands more unregistered volunteers wandering the muddy streets with gumboots and mops. Prime Minister Julia Gillard said the volunteering effort showed tremendous 'Aussie spirit' and that, "... right across Queensland today people have got up, they've marched out of their homes and they've gone to find people to help. It's a tremendous spirit of volunteering right across Queensland ...". The impact on our friends in Queensland is something that New Zealanders feel very deeply, and we just want to make sure that we're in a position to offer them support across the range of services that we have here in New Zealand. New Zealand Prime Minister John Key on the floods. Prime Minister of Australia Julia Gillard toured flood-affected areas on 31 December, the day before The Queen (Elizabeth II), sent her expressions of concern and sympathy for the victims of the floods to her representative in Queensland, Governor Penelope Wensley. The Queen later made a donation to her Queensland premier's flood relief appeal, as did her son, The Prince of Wales. In March 2011, The Prince's eldest son, Prince William, toured the affected areas in Queensland, as well as those damaged by the floods in Victoria. US Secretary of State Hillary Clinton stated, "On behalf of President Obama and the people of the United States, I offer my condolences for the loss of life and damage in Queensland caused by the recent flooding." US President Barack Obama said he was ready to help. John Key, the Prime Minister of New Zealand, held a telephone call with Gillard, during which she thanked New Zealand for its help. Len Brown, the Mayor of Auckland, a sister city of Brisbane, offered assistance to Brisbane Lord Mayor Campbell Newman. David Cameron, the Prime Minister of the United Kingdom offered his sympathies. Downing Street stated: "The Prime Minister offered his deep sympathy on behalf of the British people for those who have died, those who have lost their homes and all those who have been affected by the floods in Queensland." As we weep for what we have lost, and as we grieve for family and friends and we confront the challenge that is before us, I want us to remember who we are. We are Queenslanders. We're the people that they breed tough, north of the [New South Wales] border. We're the ones that they knock down, and we get up again. Together we can pull through this and that's what I'm determined to do, with your help, we can achieve it. Premier of Queensland Anna Bligh. Major General Michael Slater was appointed head of a civilian recovery task force. Slater was at the time also the Commander of the 1st Division based at the Gallipoli Barracks in Enoggera, Brisbane. The taskforce was later replaced by the Queensland Reconstruction Authority, a new body created to co-ordinate the rebuilding program. The Australian Defence Force's contribution to flood relief efforts was designated Operation Queensland Flood Assist. The ADF established Joint Task Force 637, based at Enoggera Barracks in Brisbane, for operational command on 1 January 2011. According to the Australian Prime Minister the deployment was the largest for a natural disaster since Cyclone Tracy. About 35 State Emergency Service personnel from New South Wales and 20 personnel from Victoria were deployed to provide relief to exhausted staff and volunteers. A national appeal was established on 29 December, with the state and federal governments giving A$1 million each. Small businesses and primary producers in 13 local government areas became eligible for grants of up to A$25,000 to pay for costs from damage incurred as a result of the floods. National Disaster Relief and Recovery Arrangements were made available to a total of 31 local government areas across Queensland. New Zealand announced that the country would send two fifteen-member civil defence teams to assist in flood rescue efforts. In addition to this, New Zealand sent a number of New Zealand Defence Force soldiers, mainly engineers, as well as New Zealand Police and New Zealand Fire Service firefighters. A New Zealand Red Cross team was also dispatched. On 9 January, the Flood Relief Appeal: Australia Unites telethon broadcast by the Nine Network from the Suncorp Piazza at South Bank Parklands, Brisbane raised more than A$10 million in pledged aid. The South Bank area which includes the Wheel of Brisbane pictured above was itself inundated by flood waters only two days later. At the first Twenty20 cricket match between Australia and England in Adelaide on 12 January, both teams donated part of their match fees to help the victims and A$28,450 was collected from people in attendance. On 16 January, the day before the 2011 Australian Tennis Open commenced, a number of players took part in the Rally for Relief which was held at Rod Laver Arena and attended by 15,000 people, which raised A$750,000. The Seven Network televised the event. Players who took part included Roger Federer, Rafael Nadal, Lleyton Hewitt, Novak Djokovic and Andy Roddick. On 27 January, the 2011 Legends of Origin charity match was contested between former New South Wales and Queensland Rugby League State of Origin players. Organised by Mark Geyer, the match raised $380,587 to go towards the recovery effort. On 13 January, Queensland Writers Centre, in partnership with Brisbane author Rebecca Sparrow, launched Writers on Rafts to raise funds for flood-affected writing communities. Authors, bloggers, publishers, organisations, festivals, and industry professionals across Australia donated their books, professional skills, and expertise, to drive and promote a fundraiser, and local celebrities donated their time to attend the Ultimate Girly High Tea. Over the course of four months, they raised over $31,000. All funds raised went to the Queensland Premier's Disaster Relief Appeal. On 11 January 2011, former deputy director of the New South Wales State Emergency Service Chas Keys stated that he was "appalled by the situation in Queensland at the moment. The large number of new houses that have been flooded proves that land management by the Queensland government is extremely poor and building is still going on in inappropriate areas." He contrasted the approach in Queensland with the practices developed in NSW after the 1955 Hunter Valley floods, that aimed to move homes out of dangerous areas and establish warning systems. Keys also stated the NSW practices were being undone by reduced funding and unsafe housing developments, giving the example of Maitland where "the council now wants to build hundreds of dwellings on the flood plain in and round the CBD". Keys also expressed concern over deforestation, stating that, "What we need is re-forestation." Ferries return to the Brisbane River on 14 February 2011. On 17 January 2011, Queensland premier Anna Bligh announced a Commission of Inquiry into the 2010–11 Queensland floods. The Commission's Terms of reference cover a wide array of related aspects and stipulate a final report would be due in one year. On 1 August 2011 the Commission handed an interim report to Ms Bligh, and the final report containing 177 recommendations on 16 February 2012. In return for Senator Nick Xenophon's support of the Queensland Flood Levy, the Government will modify the Natural Disaster Relief and Recovery Arrangements and force the states to take up disaster insurance. On 8 July 2014 legal firm Maurice Blackburn lodged a class action with the NSW Supreme Court on behalf of 4,000 flood victims. The legal action alleges negligence and nuisance against the operators of the dams: Seqwater, SunWater and the State of Queensland. The severe rainfall across Queensland resulted in a drop in world sea level by as much as 7 mm. The drop lasted for around 18 months and has been attributed to Australia's arheic and endorheic basins which soaked up the water previously evaporated from the oceans. Queensland Treasurer Andrew Fraser said it was not possible to put a figure on the damage; "other than to say the damage bill is going to start with a b and not an m". The floods will cost the Australian economy at least A$10 billion. In figures released at the end of January 2011, the Insurance Council of Australia calculated that 38,460 individual claims were lodged with insurers which were worth A$1.51 billion. Nearly half of those claims were for damage to homes and more than half were made by those living in Brisbane. The price of food across Australia will go up. The floods will cost supermarket chains tens of millions of dollars. Some communities isolated by floodwaters experienced food shortages, and a rise in the cost of fruits and vegetables was reported shortly after. Food supplies to northern Queensland were disrupted requiring groceries to be transported to Townsville by ship. Coal railway lines were closed and numerous mine sites flooded. According to an analysist at Macquarie Group almost all the available stockpiles of coking coal in Queensland were exhausted in late January 2011 due to reduced rail capacity. About 15% of the state's annual output of coal production was lost and by late March 2011 recovery was progressing slowly. Four months after the floods the Dalrymple Bay coal terminal was operating at half its capacity as the open-cut mines in the region continued to deal with de-watering issues. Swimming pool salt was in short supply as salt mines near Rockhampton were flooded. Thousands of litres of milk had to be dumped because it couldn't be transported for processing. The persistent wet conditions also caused health problems for livestock. There was severe damage to roadways in forestry plantations across wide areas of the south of the state. Prime Minister Julia Gillard announced that the government would impose a flood levy on people across Australia, to fund reconstruction works. ^ a b Delana Carbone; Jenna Hanson (29 January 2013). "Floods: 10 of the deadliest in Australian history". Australian Geographic. Archived from the original on 27 January 2013. Retrieved 9 February 2013. ^ a b "Australia: Queensland floods spur more evacuations". bbc.co.uk. BBC. 31 December 2010. Archived from the original on 21 January 2011. Retrieved 14 January 2011. ^ "Floods force mass evacuations in Queensland, Australia". bbc.co.uk. BBC. 29 December 2010. Archived from the original on 2 January 2011. Retrieved 14 January 2011. ^ "Flood costs tipped to top $30b". ABC News. Australian Broadcasting Corporation. 18 January 2011. Archived from the original on 19 January 2011. Retrieved 18 January 2011. ^ a b c "Queensland Floods Commission of Inquiry Final Report" (PDF). March 2012. pp. 386–389. Retrieved 18 April 2018. ^ Hurst, Daniel (11 January 2011). "Three-quarters of Queensland a disaster zone". Brisbane Times. Retrieved 14 January 2011. ^ V. Platonov; E. Semenov; E. Sokolikhina (13 February 2014). "Extreme La-Nina 2010/11 and the vigorous flood at the north-east of Australia" (pdf). EGU General Assembly/Geophysical Research. Retrieved 15 October 2014. ^ Francis Tapim (24 January 2011). "More natural disasters on Australia's radar". ABC News. Australian Broadcasting Corporation. Retrieved 25 October 2012. ^ "La Nina to break down later this year". ABC News Online. 1 January 2011. Retrieved 1 January 2011. ^ a b c "Special Climate Statement 24" (PDF). Bureau of Meteorology. 7 January 2011. Retrieved 18 January 2011. ^ Bureau of Meteorology (4 January 2011). "Queensland in December 2010: The wettest December on record". Monthly Climate Summary for Queensland. Commonwealth of Australia. Retrieved 25 October 2012. ^ "Heavy Rains in Queensland". NASA Earth Observatory. NASA. 12 January 2011. Retrieved 15 January 2011. ^ a b David Fogarty (12 January 2011). "Scientists see climate change link to Australian floods". Reuters. Retrieved 25 January 2011. ^ a b c d Hubert Chanson (2011). "The 2010–2011 Floods in Queensland (Australia): Observations, First Comments and Personal Experience". La Houille Blanche. Paris: Société Hydrotechnique de France (1): 5–11. ISSN 0018-6368. Retrieved 22 April 2011. ^ Leslie, Tim (21 January 2011). "Q&A – Dam expert analyses Wivenhoe". ABC News. Australian Broadcasting Corporation. Retrieved 22 April 2011. ^ Thomas Hedley (19 March 2011). "Engineer bores a hole in dam untruths". The Australian. Retrieved 19 March 2011. ^ a b c d e Hubert Chanson (2011). "The 2010–2011 Floods in Queensland (Australia): Photographic Observations, Comments and Personal Experience". Hydraulic Model Report No. CH82/11. Brisbane, Australia: University of Queensland, School of Civil Engineering (CH82/11): 127 pp. ISBN 9781742720234. ^ "Flood-hit Queensland braced for fresh storms". BBC. 5 January 2011. Retrieved 6 January 2011. ^ "Hundreds of roads closed in flooded Qld". The Sydney Morning Herald. 28 December 2010. Retrieved 30 December 2010. ^ 'La Niña and monsoonal winds flood northern Australia', New Scientist, 8 January 2011, p. 6. ^ Calligeros, Marissa (29 December 2010). "Flooding could last 'weeks, not days'". Brisbane Times. Archived from the original on 4 February 2011. Retrieved 15 January 2011. ^ "Flood destroys doctor's surgery in Theodore". ABC Rural. 10 January 2011. Retrieved 15 January 2011. ^ a b Calligeros, Marissa (30 December 2010). "From drought to flooding rains: Queensland's flood crisis continues". Brisbane Times. Retrieved 30 December 2010. ^ "Qld's 'heartbreaking' floods worst ever". The Sydney Morning Herald. Australian Associated Press. 30 December 2010. Retrieved 30 December 2010. ^ Campion, Vikki (1 January 2011). "Flooded towns in Queensland declared disaster zones". The Daily Telegraph. Retrieved 1 January 2011. ^ a b c "Rockhampton faces forced evacuations". ABC News Online. Australian Broadcasting Corporation. 31 December 2010. Retrieved 3 January 2011. ^ a b c Gorrie, Arthur (4 January 2011). "SES volunteers take goodwill gift". The Gympie Times. Retrieved 4 January 2011. ^ "Rockhampton Airport shuts down". The Morning Bulletin. 3 January 2011. Retrieved 3 January 2011. ^ a b "Queensland floods: Rockhampton floodwaters 'peak'". BBC. 5 January 2011. Archived from the original on 6 January 2011. Retrieved 7 January 2011. ^ a b Fickling, David; Brindal, Ray (30 December 2010). "Rains Hit Australian Coal Mines". Wall Street Journal. Archived from the original on 25 January 2011. Retrieved 30 December 2010. ^ O'Sullivan, Matt (4 January 2011). "Losses and delays in flooded state". The Sydney Morning Herald. Retrieved 4 January 2011. ^ a b "Worst over for Gayndah, Mundubbera". NineMSN. 29 December 2010. Archived from the original on 6 January 2011. Retrieved 4 January 2011. ^ Koch, Tony (31 December 2010). "Disease next threat as barely a drop to drink in flooded Queensland towns". The Australian. Retrieved 4 January 2011. ^ "Sugar backlog slowly clearing from Bundaberg port". ABC Rural. Australian Broadcasting Corporation. 23 March 2011. Retrieved 4 June 2011. ^ "Disasters declared in flood-hit Qld towns". The Sydney Morning Herald. Australian Associated Press. 28 December 2010. Retrieved 4 January 2011. ^ Trenwith, Courtney (30 December 2010). "Heartbreak beneath the flood slick". Brisbane Times. Archived from the original on 4 February 2011. Retrieved 30 December 2010. ^ "Drinking water trucked into flood-ravaged Dalby". Australian Associated Press. Herald Sun. 30 December 2010. Retrieved 1 January 2011. ^ O'Loan, James (28 December 2010). "Residents evacuate as flooding grips much of Queensland". The Courier-Mail. Retrieved 4 January 2011. ^ a b "Disease fears grow as flooding hits towns' water supplies and rivers rise in Queensland". The Courier-Mail. 30 December 2010. Retrieved 30 December 2010. ^ a b "Some Queensland flood victims facing long wait to return to their flooded homes". The Australian. 30 December 2010. Retrieved 30 December 2010. ^ a b c "Torrential rain raises alarm for Toowoomba, Maryborough, Gympie, Wide Bay, Kingaroy, Cooloola and Brisbane". The Courier Mail. 10 January 2011. Retrieved 10 January 2011. ^ "Goondiwindi community flees ahead of rising river". Brisbane Times. 13 January 2011. Retrieved 13 January 2011. ^ a b c Atfield, Cameron; Hurst, Daniel (10 January 2011). "Four confirmed dead in Toowoomba flash flooding". Brisbane Times. Australian Associated Press. Retrieved 10 January 2011. ^ "Two dead as raging torrent swamps Toowoomba". ABC News. 10 January 2011. Archived from the original on 11 January 2011. Retrieved 10 January 2011. ^ Fraserq, Andrew (12 January 2011). "A once-in-a-century storm and an already saturated and hilly landscape were the ingredients for the tragedy that engulfed Toowoomba". The Australian. Archived from the original on 19 January 2011. Retrieved 12 January 2011. ^ Graham Lloyd (15 January 2011). "An inland tsunami – like a fury from hell". The Australian. Retrieved 10 March 2011. ^ Johnson, Callum (10 January 2011). "Withcott evacuated". Toowoomba Chronicle. Retrieved 11 January 2011. ^ "Grantham is a town left in tatters". ABC News. 11 January 2011. Archived from the original on 26 January 2011. Retrieved 14 January 2011. ^ "Flooding In The Brisbane River Catchment January 2011: Volume 1 Overview" (PDF). ICA Hydrology Panel. Insurance Council Of Australia. 20 February 2011. pp. 66–67. Retrieved 10 October 2015. ^ "Flood toll rises to 10, 78 missing". The Courier Mail. Australian Associated Press. 11 January 2011. Retrieved 11 January 2011. ^ Ferguson, John; Schulz, Matthew (14 January 2011). "Queensland toll at 16 after body found". Herald Sun. AAP and The Courier-Mail. Retrieved 14 January 2011. ^ "Flood victims' family demands judicial inquiry". Brisbane Times. 5 June 2012. ^ "Raging floods bear down on Brisbane". Australian Broadcasting Corporation. 11 January 2011. Archived from the original on 19 January 2011. Retrieved 11 January 2011. ^ Hayden Donnell (11 January 2011). "Workers flee Brisbane city centre". www.nzherald.co.nz. Retrieved 11 January 2011. ^ Dibben, Kay (11 January 2011). "Evacuation centre set up at Bowen Hills". The Courier-Mail. Retrieved 11 January 2011. ^ Long, Stephen (12 January 2011). "City braced for the worst: Brisbane Lord Mayor". PM. Australian Broadcasting Corporation. Retrieved 13 January 2011. ^ Malikin, Bonnie (13 January 2011). "Australian floods wreak havoc on Queensland economy". The Daily Telegraph. London. Archived from the original on 20 January 2011. Retrieved 14 January 2011. ^ a b Richard Brown; Hubert Chanson; Dave McIntosh; Jay Madhani (2011). "Turbulent Velocity and Suspended Sediment Concentration Measurements in an Urban Environment of the Brisbane River Flood Plain at Gardens Point on 12–13 January 2011". Hydraulic Model Report No. CH83/11. Brisbane, Australia: The University of Queensland, School of Civil Engineering (CH83/11): 120 pp. ISBN 978-1-74272-027-2. ^ "Police sent in as flood death toll rises". ABC News. Australian Broadcasting Corporation. Retrieved 13 January 2011. ^ Calligeros, Marissa (14 January 2011). "Riverwalk becomes 300m floating missile". Brisbane Times. Australian Associated Press. Archived from the original on 13 January 2011. Retrieved 14 January 2011. ^ McMahon, Bruce (14 January 2011). "Bubbling cauldron needs river to drop". Courier Mail. Retrieved 14 January 2011. ^ "Queensland Flood History". Bureau of Meteorology. Retrieved 22 April 2011. ^ Richard Brown; Hubert Chanson (2012). "Suspended sediment properties and suspended sediment flux estimates in an inundated urban environment during a major flood event". Water Resources Research. USA: AGU. 48 (48): Paper W11523, 15 pages. Bibcode:2012WRR....4811523B. doi:10.1029/2012WR012381. ISSN 0043-1397. ^ Richard Brown; Hubert Chanson (2013). "Turbulence and Suspended Sediment Measurements in an Urban Environment during the Brisbane River Flood of January 2011". Journal of Hydraulic Engineering-ASCE. Reston VA, USA: ASCE. 139 (139): 244–252. doi:10.1061/(ASCE)HY.1943-7900.0000666. ISSN 0733-9429. ^ Stolz, Greg; Chester, Darren (15 January 2011). "Help finally arrives in Brisbane's west". Courier Mail. Retrieved 15 January 2011. ^ "Brisbane, Ipswich treading water". Adelaide Advertiser. 12 January 2011. Retrieved 12 January 2011. ^ "Bremer River at Ipswich peaks at 19.5m, lower than 1974 flood level". Courier Mail. 12 January 2011. Retrieved 12 January 2011. ^ "Firefighter recounts boy's tragic flood death". ABC. 29 February 2012. Retrieved 25 August 2016. ^ a b Elks, Sarah (12 January 2011). "Ipswich body brings toll to 13". The Australian. Retrieved 12 January 2011. ^ "Queensland flood death toll rises to 12". NineMSN. 12 January 2011. Archived from the original on 13 January 2011. Retrieved 12 January 2011. ^ "Bull sharks seen in flooded streets". The Queensland Times. 24 January 2011. Retrieved 14 January 2011. ^ "Somerset bridges to reopen". The Queensland Times. 1 March 2012. Retrieved 10 June 2013. ^ "Controlled releases at Wivenhoe cut". Nine News. NineMSN. 12 January 2011. Archived from the original on 5 April 2012. Retrieved 12 January 2011. ^ "Wivenhoe Dam to release 12,000 cubic metres of water every second". The Courier Mail. 11 January 2011. Retrieved 17 January 2010. ^ "Wivenhoe and Somerset Dams" (PDF). Seqwater. Retrieved 17 January 2010. ^ Maizey, Judith (11 January 2011). "On the road in Logan today". The Logan West Leader. Archived from the original on 15 January 2011. Retrieved 13 January 2011. ^ Jackson, Zane (11 January 2011). "Wivenhoe Dam hits record high". The Queensland Times. Retrieved 13 January 2011. ^ O'Loan, James; Robertson, Josh; MacDonald, Andrew; Michael, Peter; Higggins, Kate (28 December 2010). "Ten towns on flood alert as Queensland soaks up heavy rain". The Courier-Mail. Australian Associated Press. Retrieved 4 January 2011. ^ "Flood victim's body may have been found". Brisbane Times. Australian Associated Press. 1 December 2010. Retrieved 9 January 2011. ^ "Elderly man found dead in flood waters". Brisbane Times. Australian Associated Press. 5 December 2010. Retrieved 9 January 2011. ^ "Body found in car swept into flood waters". Brisbane Times. Australian Associated Press. 9 December 2010. Retrieved 9 January 2011. ^ "Body found, towns prepare for more flood misery". news.com.au. News Limited. 2 January 2011. Retrieved 9 January 2011. ^ "Man charged over Queensland flood death". ABC News. Australian Broadcasting Corporation. 7 January 2011. Retrieved 9 January 2011. ^ Passmore, Daryl; Hinde, Suellen (9 January 2011). "Floods death count climbs to 11". The Sunday Mail. Qld. Retrieved 9 January 2011. ^ Calligeros, Marissa (10 December 2010). "Body of drowned teen found". Brisbane Times. Retrieved 9 January 2011. ^ "Body found in Brisbane River". Brisbane Times. Australian Associated Press. 20 December 2010. Retrieved 9 January 2011. ^ Calligeros, Marissa (30 December 2010). "Man found dead in flooded creek". Brisbane Times. Retrieved 9 January 2011. ^ Kieran Campbell (12 January 2011). "Heartbreak over deaths in floods". Sunshine Coast Daily. Archived from the original on 14 January 2011. Retrieved 12 January 2011. ^ a b Ferrier, Tracey; Agius, Kym; Gray, Steve; Ja, Crystal (11 January 2011). "Qld flood death toll rises to 10". The Sydney Morning Herald. Australian Associated Press. Retrieved 11 January 2011. ^ Calligeros, Marissa (13 December 2010). "Teenager drowned in arms of friends". Brisbane Times. Retrieved 9 January 2011. ^ "Flood death as Rockhampton faces catastrophe with more cyclones predicted". Australian Associated Press. news.com.au. 3 January 2011. Retrieved 9 January 2011. ^ Maynard, Neale (11 January 2011). "Horrific scenes at Grantham". The Courier Mail. news.com.au. Retrieved 12 January 2011. ^ "Devastated Toowoomba resembles 'ghost town'". 11 January 2010. Archived from the original on 6 July 2011. Retrieved 11 January 2010. ^ Colgan, Paul (11 January 2011). "24/7 Queensland floods info centre: updates, photos, advice and messages for loved ones". news.com.au. News Limited. Archived from the original on 19 January 2011. Retrieved 11 January 2011. ^ "Queensland's flood heroes tell their story". The Daily Telegraph. 14 January 2011. Retrieved 18 January 2011. ^ Travierso, Michelle (13 January 2011). "Heroism in the Floods: A Courageous Tale of Sacrifice From a Submerged Australia". Time News Feed. Time Inc. Retrieved 18 January 2011. ^ Box-Turnbull, Greig (17 January 2011). "Australia floods: Dad pays tribute to Jordan Rice, the teen who gave his life for his brother". Daily Mirror. Archived from the original on 3 February 2011. Retrieved 18 January 2011. ^ Reals, Tucker (13 January 2011). "Jordan Rice, 13, Tragic Hero of Australia Floods". CBS News. Retrieved 18 January 2011. ^ "It's an Honour". www.dpmc.gov.au. Retrieved 19 March 2018. ^ "Salvation comes with brooms and gumboots". The Sydney Morning Herald. 16 January 2011. Archived from the original on 4 February 2011. Retrieved 18 January 2011. ^ "Workers praised for tireless clean-up efforts". ABC News. Australian Broadcasting Corporation. 18 January 2011. Archived from the original on 19 January 2011. Retrieved 18 January 2011. ^ Transcript of press conference, Grafton 15 Jan 2011 – Prime Minister of Australia Press Office Archived 29 February 2012 at the Wayback Machine – retrieved 13 December 2011. ^ a b TVNZ wire staff (13 January 2011). "Key: Economic impact of floods enormous". TVNZ. Television New Zealand. Retrieved 13 January 2011. ^ "Queen offers sympathies to flood-hit Qld". Sky News. Australian News Pty Ltd. 1 January 2011. Retrieved 3 January 2011. ^ "Message following the flooding in Queensland, Australia, 31 December 2010". The official website of The British Monarchy. The Royal Household. 31 December 2010. Archived from the original on 8 January 2011. Retrieved 4 January 2011. ^ "Queen makes private donation to aid Australian flood relief". Toronto Star. Associated Press. 12 January 2011. Retrieved 14 January 2011. ^ Clarence House (14 January 2011). "News and Gallery > News > The Prince of Wales makes a donation to the flood relief efforts in Queensland". Queen's Printer. Archived from the original on 19 January 2011. Retrieved 14 January 2011. ^ "Prince William to visit Australia". ABC. 8 March 2011. Retrieved 8 March 2011. ^ a b Townsend, Samantha; Rehn, Alison; Jones, Gemma (5 January 2011). "Obama ready to step in as Queensland flood crisis deepens". The Daily Telegraph. Retrieved 5 January 2011. ^ TVNZ wire staff (12 January 2011). "Auckland offers support to flood-ravaged sister city". TVNZ. Television New Zealand. Retrieved 13 January 2011. ^ "Boy, 13, sacrifices his life to save brother in raging Australian floods". Daily Mail. London. 12 January 2011. Archived from the original on 22 January 2011. Retrieved 26 January 2011. ^ "Flood death toll rises as major search gets under way for the missing". Adelaide Advertiser. 13 January 2011. Retrieved 13 January 2011. ^ Jessica Marszalek (19 January 2011). "New body set up to rebuild Queensland". Brisbane Times. Retrieved 31 January 2011. ^ "Operation QUEENSLAND FLOOD ASSIST". Department of Defence. Archived from the original on 6 January 2011. ^ "Gillard announces troop boost for floods". Sydney Morning Herald. 14 January 2011. Retrieved 17 January 2011. ^ Bligh, Anna (31 December 2010). "Other states sending aid to Queensland". Ministerial Media Statement. Queensland Government. Retrieved 5 January 2011. ^ Roberts, Neil (27 December 2010). "Disaster Relief and Recovery Arrangements extended". Ministerial Media Statement. Queensland Government. Retrieved 5 January 2011. ^ TVNZ wire staff (13 January 2011). "Second NZ civil defence team headed to Qld". TVNZ. Television New Zealand. Retrieved 13 January 2011. ^ TVNZ wire staff (12 January 2011). "NZ red cross team named for Oz". TVNZ. Television New Zealand. Retrieved 13 January 2011. ^ "Almost $30m raised in Qld flood appeal". ABC News. Australian Broadcasting Corporation. 10 January 2011. Archived from the original on 19 January 2011. Retrieved 10 January 2011. ^ Summerford, Matt (13 January 2011). "Match fees donation will help victims of Queensland floods". The Independent. London. Retrieved 13 January 2011. ^ a b Quayle, Emma (17 January 2011). "Open hearts: rivals rally around to help raise funds for flood relief". The Sydney Morning Herald. Retrieved 17 January 2011. ^ Purdon, Fiona (19 January 2011). "Writers put words into action". The Courier-Mail. Retrieved 19 March 2018. ^ "Australia: Flood management expert speaks to the World Socialist Web Site". World Socialist Web Site. International Committee of the Fourth International. Retrieved 15 April 2013. ^ "Flood inquiry announced as death toll rises". ABC News Online. Australian Broadcasting Corporation. 17 January 2011. Archived from the original on 19 January 2011. Retrieved 17 January 2011. ^ "Queensland's flood inquiry: the terms of reference". Brisbane Times. 17 January 2011. Retrieved 17 January 2011. ^ Jodie van de Wetering (1 August 2011). "175 recommendations in interim flood report". Australian Broadcasting Corporation. Archived from the original on 2 August 2011. Retrieved 2 August 2011. ^ Wilson, Lauren (23 March 2011). "Gillard's flood and cyclone levy wins vote". The Australian. ^ Thomas, Hedley (8 July 2014). "Queensland floods class action to begin in NSW Supreme Court". The Australian. ^ Tim Radford (23 August 2013). "Australian floods of 2010 and 2011 caused global sea level to drop". The Guardian. Retrieved 23 August 2013. ^ Rogow, Geoffrey (11 January 2011). "Australian Dollar Down Late As Flood Impact Increases". The Wall Street Journal. Dow Jones Newswires. Archived from the original on 21 January 2011. Retrieved 11 January 2011. ^ Lee, Jane; AAP (12 January 2011). "Queensland floods 'could wipe $13 billion off economic growth'". news.com.au. Retrieved 14 January 2011. ^ "Flood costs tipped to top $30b". ABC News Online. Australian Broadcasting Corporation. 18 January 2011. Archived from the original on 19 January 2011. Retrieved 25 January 2011. ^ Geoff Easdown (31 January 2011). "Queensland flood insurance claims top $1.5b". Herald Sun. Retrieved 6 February 2011. ^ a b Michael Evans (25 January 2011). "Woolies slims a bullish forecast down to 5–8%". The Age. Melbourne. Retrieved 25 January 2011. ^ Trenwith, Courtney (4 January 2011). "Hercules to the rescue". Brisbane Times. Archived from the original on 4 February 2011. Retrieved 4 January 2011. ^ Matt Chambers (24 January 2011). "Coking coal prices to skyrocket as stockpiles dry up". The Australian. Retrieved 25 January 2011. ^ "Floods cut Australia's Queensland coal output 30 mln/t-council". Reuters Africa. 1 April 2011. Retrieved 1 April 2011. ^ "Queensland's Dalrymple Bay coal terminal runs at only 50% of capacity". Platts. 3 May 2011. Retrieved 5 May 2011. ^ Jessica Johnston (4 January 2011). "Coast salt supplies dry up after floods". goldcoast.com.au. News Limited. Retrieved 25 January 2011. ^ Brad Markham (28 January 2011). "Floods hit farmers in the pocket". ABC Wide Bay. Australian Broadcasting Corporation. Retrieved 31 January 2011. ^ Jo Skinner (24 January 2011). "Drivers warned to avoid flood-hit plantation roads". ABC News Online. Australian Broadcasting Corporation. Retrieved 31 January 2011. ^ Levy, Megan (27 January 2011). "Levy to pay for $5.6b flood bill". Brisbane Times. Retrieved 27 January 2011. Wikimedia Commons has media related to 2010–2011 Queensland floods. "Queensland Floods Commission of Inquiry Final Report" (PDF). March 2012.